So we went to Salento and this has been One day. So we went to do this walking track and we didn’t know if we wanted to do horse riding or walking. And i’m glad We did horseriding because it was so much fun from all the rocky track. We went to coffee farm. Which was so much fun even from the start because we were in a Jeep, and we could stand up. We got all that fresh air and it felt so breezy , I love sticking my head out of the window and this was even better. So we got there and we were shown handmade how to do this stuff. When we went down to pick up coffee beans and put it back to make some coffee. We also had a photo shoot which was cool I had to put this on here so looks so good with a poncho that awesome Hat . Artistshouses are an amazing selection of six holiday homes filled with art, soul and good vibes, in North Queensland, Australia and Berlin, created by Matthew, Tina, Pablo and Hugo Wild. Tina Gonsalves is an artist. Matthew Wild is a chef. 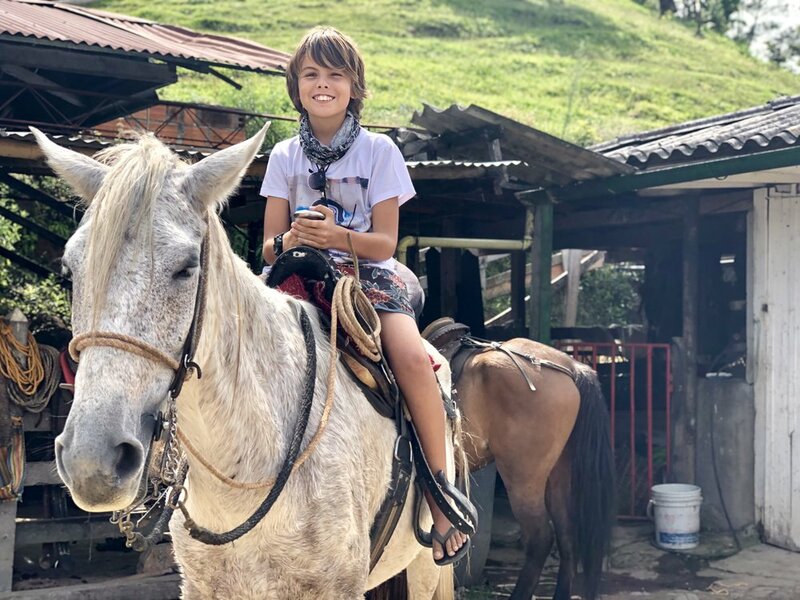 Their son, Pablo Wild is nine and sees the world as his home. Little Hugo is loving the adventures. We travel a lot, but when we are not, we live between Beautiful Port Douglas,and amazing Berlin, and we love to spend time in Goa, India as well. Our homes are created from love, hard work, and a passion of collecting and making. We search the world for items we love. As much as possible, we try to use recycled building materials, and upcycle furniture. Our houses aren't fussy or pretentious, but they are all about charming you, making you feel great, and most importantly about love and celebrating the creative spirit! Stop searching - you have found the perfect holiday homes! Houses that create wonderful memories, inspire the senses, and most of all, feel like a home away from home. Pablo Wild is eight years old. He has traveled a lot in his young life. As part of his schooling this year, he will be writing a journal to share and remember his travels. From China, to Morocco, to Europe, to India, its been an incredible childhood. Check out his blog. Pablo says his favorite country is India. He loves apples. And he love his little brother hugo, even though sometimes he annoys him. He also loves minecraft. He loves swimming on the beach and surfing, he likes karate, and he loves his friends and all of his family. He wishes there was no pollution, no wars,no guns and no shoes. This year, we will also be writing our own blog about traveling with a family. We have never let parenthood stop our quest to explore the world. Its not a traditional life we are living, and some might say our lifestyle is brave with such a young family, but as hard as it can be, it feels like each day something new is learned, and discovered. We are always greeted with such warmth and smiles. The kids have got used to having their daily sleeps around chaos, on trains, tricycles, ferries, planes. Its made them calm little confident beings, and Pablo is developing such curious nature about the world. Its been brilliant for them, and for us a parents. 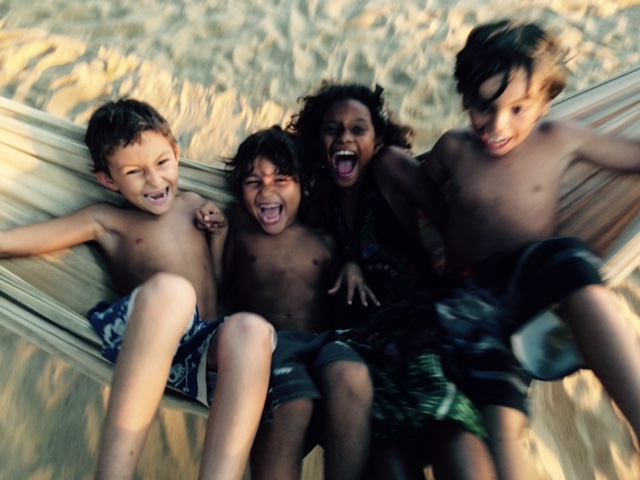 I hope our kids see the world as their home, and that there are many different ways to live a life. It definitely a challenge taking your kids out of the normal life, but for us, its been an incredible adventure. Our blog documents the adventures and challenges of our 2016 journey.